The Nature Zoo Famous Ngorongoro Crater, 2,286 metres above sea level, is the largest un broken caldera in the world. Surrounded by very steep walls rising 610 metres from the crater floor, this natural amphitheatre covers 260 square km. That's 100 square miles and is home to over 25,000 large mammals. About half of the animals are zebras and wildebeests. 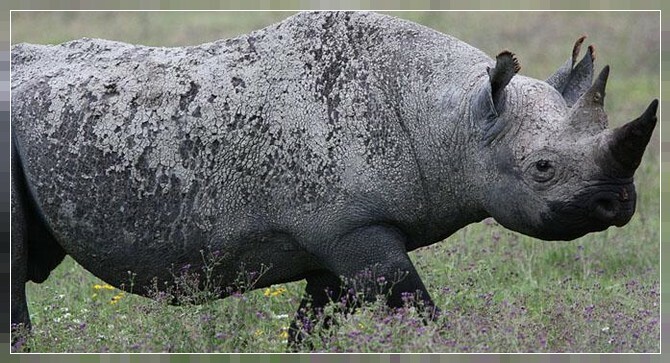 There are also gazelles, buffaloes, elands, hartebeests, warthogs, and the rare rhinoceros. Occasionally Maasai can also be seen bringing their cattle down the crater walls to the lake below. Such vast numbers of animals attract many predators, including lions, hyenas, cheetahs, and leopards. More than 100 species of birds not found in the Serengeti can also be spotted here. Countless flamingoes from a pink blanket over the soda lakes. The Crater has been declared a World Heritage site. The Ngorongoro crater lies within Ngorongoro Conservation Area, which covers more than 8,000 square km. It is bounded Lake Eyasi in the southwest and the Gol Mountains in the north. Roughly in the center is the Olbalal Swamp and the arid. Olduvai Gorge: It is dotted with extinct craters and high plains and to the north is Oldonyo le Ngai, a grey, forbidding perfest cone that is a still-active volcano.